This short work by Edward FitzGerald was born out of his desire to put down on paper some recollections of his early career in local government, and in particular those relating to the formation and early days of what was then known as Benfleet Urban District Council. He had lost substantially all of his sight by 2004, the year following the death of his wife, Ida, and so I loaned him a small dictating machine. What follows is the product of his efforts, as he tucked himself away in our house in Kent and dictated to tape his memories. How well he coped with the technology. Edward was very pleased with the results once transcribed and read to him. Following his death in 2008, his family thought it would be a waste if his work was not more widely known. And so we resolved that since I had by then retired, I would edit the book and present a copy to Castle Point District Council, the successor local authority to Benfleet Urban District Council. Sadly inertia set in, for which I am entirely to blame. Nothing was done to further our good intentions until I finally galvanised myself into action this year and completed the enterprise. In doing so I have had invaluable assistance from my brother Andy, and in particular from Edward’s granddaughter, Hannah Witchell and her husband, Ben, to whom I am greatly indebted. My sister Christine, Andy and I are very proud of what our mother and father achieved in their lives, and also grateful for the values they passed on to us. We dedicate what follows to the memories of our parents and the very happy times we spent together as a family. Charles Edward FitzGerald was born on 1st August 1913 at Rochester in Kent, the middle child of three children born to his parents Nigel Stanley and Lizzie FitzGerald. He died on 10th December 2008, aged 94. His brother Clem predeceased him but he is survived by his sister, Norah Ireland, who lives in Pendeen, West Cornwall. Edward spent his formative years in Thundersley, Essex, the family living at “Moxley House”, Mount Crescent and latterly at “Vale View”, Kiln Road. Edward attended school there and also at Palmers School, Grays and in Southend-on Sea. He joined the newly-constituted Benfleet Urban District Council on 1st February 1930 as a junior clerk in the Town Clerk’s Department. After five years, and at the young age of 22, Edward was appointed Deputy Clerk of the Council at Rayleigh in 1935, a move which was to shape the next 60 years of his life. He was appointed Clerk of the Council at Rayleigh in June 1939, then aged 25, and went on to have a distinguished career in that post for 35 years. At his retirement in 1974, upon local government reorganisation, he was then the longest-serving Town Clerk of an Urban District Council in the country. During the war years Edward held a number of special posts such as Food Executive Officer, Local Fuel Officer and National Registration Officer. As Civil Defence Controller, Edward played a significant part in the relief effort after the East Coast flooding in 1953. Until his retirement Edward was the Returning Officer for the Urban District Council elections in Rayleigh and also for the Parliamentary elections for the then constituency of Essex, South East. His outstanding service to local government in Essex was duly recognised with the award of the MBE in 1975. Having lived in Rayleigh for the greater part of his life Edward was very proud of and interested in the town and with his good friend Ernie Lane, Edward was co-author of a book about Rayleigh which was published in 1991, entitled “Rayleigh – A Pictorial History”. Edward was a founder member of the Rotary Club of Rayleigh and a former President of the club. He was also a sidesman at Holy Trinity church, Rayleigh for a number of years. 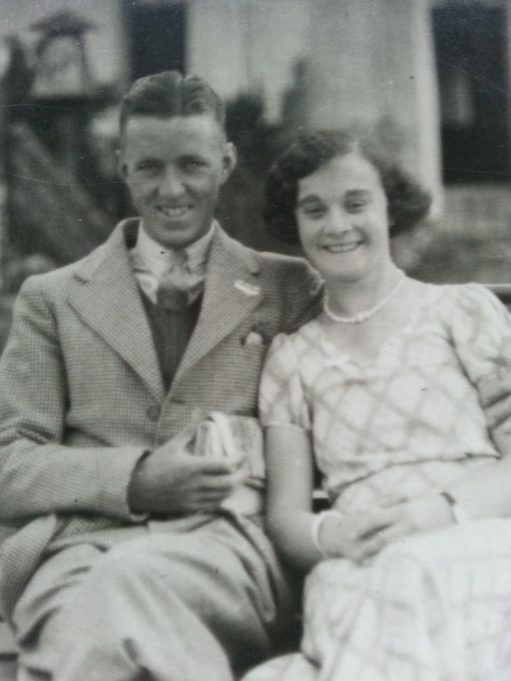 In July 1939 Edward married Florence Ida Jay at Saint Mark’s church, Southend. After living in Rayleigh for many years, Edward and Ida moved to Leigh-on-Sea in 1996. Ida died in November 2003. Edward and Ida are survived by their three children, Christine, Michael and Andy and by their six grandchildren and six great grandchildren. The Castle Point District Council was formed in April 1974 by an amalgamation of two adjoining urban district councils, namely, the Benfleet Urban District Council and the Canvey Island Urban District Council. In this short book I endeavour to recount the very early days when the Benfleet Urban District Council was first formed in January 1930. I speak from actual experience as I was one of the first members of the staff to be appointed in that year. I regret that I have little knowledge of the early days of the Canvey Island Urban District Council and I must leave those details to be reported by someone better informed than me. I should like to point out that I am in my 91st year and, unfortunately, have lost 99% of my eyesight. I therefore have had to rely solely upon my memory for these recollections and have been unable to check certain of the facts by confirming them in a reference book. I say this for the simple reason that, should readers find any errors, then I apologise in advance. I dedicate this work to the memory of my dear wife Ida who passed away in November 2003 after 64 years of a very happy married life. First of all I think I should define the area of south-east Essex, to which my booklet relates. This is an area south of the River Crouch extending to the Thames estuary and from its eastern boundary of Foulness Island and Great Wakering in a westerly direction to the parishes of Rawreth and South Benfleet. When referring to this area of south-east Essex I exclude the area of Southend-on-Sea and the Shoeburyness area as they themselves obtained urban powers in the period. The Local Government Act of 1894 established certain councils which took over the duties formerly carried out by the Board of Guardians. Thus the Rochford Rural District Council was formed which then administered the whole of the area of south-east Essex I have described. This Act also set up parish councils for most towns and hamlets and thus most of the towns in south-east Essex had a parish council. This state of things proceeded unchanged until 1926 when the Canvey Island Urban District Council was formed. In the late 1920s the central areas of south-east Essex began to develop as large numbers of families in east London, in places such as East Ham and IIford, sought a new life in the area. As a result, certain of the parish councils were a little unhappy as they felt that the largest amount of revenue collected, and the rates, were mostly being spent within the Rochford parish area. A number of meetings and consultations took place between various parish councils and, as a result of representations made to the Essex County Council, the authority responsible for boundary changes, the government issued an order in October 1929. This order was entitled The Essex (Benfleet and Rayleigh Urban Districts) Confirmation Order 1929. This Order, as it says, established two new urban districts, Benfleet Urban District consisting of the parishes of Thundersley, Hadleigh and South Benfleet, and Rayleigh Urban District consisting of the parishes of Rayleigh and Rawreth. The Benfleet Urban District Council first came into operation on the 1st January 1930. But before that date the new authority had certain functions to perform, such as appointing senior officers and securing suitable headquarters from which to operate. The authority endeavoured to find premises more or less central to the new area and it chose a large detached house called “The Manse”, situated at the junction of Kenneth Road and Kiln Road, Thundersley. The house, which is still in existence, was two-storey. It had a double frontage with a hall running down the centre of the ground floor and it stood in fairly large grounds. These grounds were used at an early date to provide pre­fabricated offices for the increased staff that had to be appointed from time to time. Dealing with the house, on entering the front door, on the right – or the east side of the building – was quite a large room, roughly sixteen by thirteen feet, and this was the private office of the Clerk of the Council and was also used as the committee room for the new Authority. I can remember that the Clerk had his own desk in the window and behind was a large mahogany table around which were some sixteen chairs and this was where all the committee meetings were held. In those early days, when it was thought that there was no danger from smoking, nearly every member adopted that habit, and you can well imagine the atmosphere in this room, after three or four hours, when most of the sixteen or so people present were smoking quite heavily. The office on the other side of the hallway – in other words the westerly side – was first occupied by the Rating Officer, and in the room behind were the staff of the Clerk of the Council which was the room that I occupied with another colleague. The building had a kitchen at the rear and an outside toilet. Upstairs, the front room on the east side was occupied by the Sanitary Inspector. Note his description; the officers were not known as Public Health officers at that time. The room behind was occupied by the Finance assistant. On the other side of the hallway was a room occupied by the Engineer and Surveyor, and the room behind by his staff and at the end of the hallway was a combined toilet and washroom. This was for the use of the male members of the staff until female members were appointed when they were allocated the use of the indoor toilet, and we males had to make use of the outside toilet in the grounds for some little time. This was not too pleasant, as one can imagine, in cold and inclement weather. The first Clerk was Mr P. W. Burge (Deputy Clerk of the Beddington and Wallington Urban District Council in Surrey). Mr Burge was a somewhat portly gentleman, very pleasant, and he took up residence at Templewood Road in Hadleigh. Unfortunately, his period in office was not long, for he unfortunately sustained a wasp sting and complications set in which sadly proved to be fatal. He was succeeded by Mr Daniel Grudgings (previously Deputy Town Clerk of Twickenham). Contrary to what his surname might suggest, I remember that Mr Grudgings had a very pleasing personality and he was most popular with the members of the Council, the staff and the public. He remained with the authority as the chief officer until he retired. In the early days from the 1st January 1930, the Clerk of the Council had a committee clerk by the name of Albert Bainbridge and he came from the Coulsdon and Purley Urban District Council, again, in Surrey. I was the third member of the Clerk’s department, being appointed junior clerk, and I commenced my duties on the 3rd February 1930. Mr Bainbridge was subsequently promoted to Assistant Clerk, and I quickly saw that it would be to my advantage to learn shorthand and typing. This I duly did, and I was appointed a committee clerk in about 1932. To complete my own history, I was appointed Deputy Clerk to the adjoining Council, namely Rayleigh, in 1935 and then, in 1939, I was promoted to the post of Clerk of the Council, a position which I was privileged to hold until my retirement from local government in 1974 upon the reorganisation of local government nationwide. The first Chairman of the new Authority was Mr A. R. Adams of Thundersley who became a Justice of the Peace by virtue of his office. The first Vice-Chairman was Mr W. Bingham of South Benfleet. As previously described, the committee meetings of the new authority were held in the office of the Clerk of the Council at its headquarters in Thundersley. The monthly meetings of the full Council were held at the various Council schools, in order: first, say, Thundersley, then Hadleigh, then South Benfleet, and so on. For these full Council meetings the papers that one might anticipate would be required for the Council meeting had to be packed up and stacked. These included the file for each committee that was reporting to the Council, as one had no idea what questions the various members might raise. It was my job to gather these papers together and, as transport then was very limited, it was arranged that the surveyor, Mr Booth, would take these files of papers by car to the Council school where the meeting was to be held. His car was a two-seater only, with what was termed a ‘dickie’ seat at the rear. The papers would be put in the back and I was conveyed to the meeting in the ‘dickie’ seat, which in inclement weather was far from ideal. There was no protection from the wind or the rain, other than for the two people in the front seat. Sometimes the meetings did not finish until after 11pm or so and it was not a very happy predicament to return the papers to the offices after the meeting. One of my jobs in the office was to duplicate the various committee reports and to staple them together in book form and these were then delivered by me to the eighteen councillors around the district. Sometimes we were delayed in preparing the documents and that meant delivering the papers on a number of occasions, particularly in the winter months, in darkness. There were not the street lights that there are today; the only lights available were perhaps a small gas light at a road junction here and there, and it was a somewhat hazardous task in winter delivering these documents. In particular, the one address that I used to hate going to was that of Mr Hurst at Wittering Court, Daws Heath. This was a large detached house with a long entrance drive from the front gates. I think that Mr and Mrs Hurst may have been somewhat frightened of intruders. At night they had two savage dogs on each side of the footpath, each on a long wire and, as you walked up the footpath – in darkness of course – you had these two dogs either side of you doing their best to reach you. It is true that when we got to the house of course the Hursts called the dogs off, and I could walk away quite easily, but you can imagine how nervous I was walking up there with the dogs howling at me from each side. The 1930s were a very busy time for the new Authority. There was much to be done, such as the construction of new sewerage and sewerage facilities throughout much of the new urban district. There was little street lighting and this was tackled with vigour. In addition, most of the roads other than the main roads were just mud tracks, and the new Council adopted a progressive programme of making up these private streets. The districts developed quite rapidly and their population steadily increased year by year. When the authority was first created in 1930 I would estimate that the population of the district was, roughly, about 14,000. Each of the three parishes was roughly the same in rateable value and much of the work had to be done by securing a loan for the particular scheme. As one can imagine, it would be quite impossible to pay in full for all the work that had to be executed and which would continue for a number of years. Therefore the policy was that when a particular scheme had been prepared and priced, the authority applied to central government for a loan sanction. When the loan sanction was received the authority then raised the money from the Public Works Loan Board. This was a particular central government department appointed to assist local authorities in their development programmes. As the reader can well imagine, the visual difference between the districts today and how they appeared in 1930 is enormous. As an illustration, I recall going to the churchyard at St Peter’s Church, Thundersley, and looking across the vista. You could see New Thundersley and I remember that there were no made up roads except the London Road, the A13, and the road to Thundersley Church. Other than that, and prior to their adoption, all the roads were just a quagmire in winter, including Kents Hill Road. You could count on the fingers of two hands the number of houses that you could see between Thundersley Church and, say, Tarpot’s Corner. Today, if you looked at the same view, you would see thousands of houses – a complete town, in effect – with all the roads made up, with one or two exceptions. The main effort of the new Council was to provide better sewerage facilities. I recall that the Council engaged consultants from Westminster – Messrs Lemon and Blizard – and Mr Blizard would normally attend the meetings when sewerage matters were being discussed. I remember, too, that the Council acquired the open land known as The Downs at South Benfleet together with one property situated on the land and called ‘Ray View‘. This was a considerable purchase and much appreciated, I know, by the residents of the Benfleet area in particular. One interesting matter that arose in the early days of the new Council was a proposal by the Essex County Council to enlarge the district administered by the new authority and also to enlarge the adjoining urban district of Rayleigh. The proposal was that the area administered by the Benfleet Urban District Council should be enlarged to take in Pitsea, Vange and Basildon, and that the area administered by the Rayleigh authority be enlarged to take in Wickford and Nevendon. The object of the County Council was not to reappoint a large rural district to the west of both Authorities named the Billericay Rural District Council. The County Council wished to re-apportion the areas of that rural authority abutting the boundaries of the surrounding districts so that, for example, the town of Billericay would go to Brentwood Urban Council and other areas would go to the adjoining authority, Orsett Rural District Council. Both the Benfleet and Rayleigh Councils strongly objected. One can appreciate this objection because they had only been formed themselves a matter of two or three years, and there was much to be done in the way of improvements that I have previously described. As a result of the objections made by both the Benfleet and Rayleigh Councils, the County Council withdrew its proposals and established the Billericay authority as an urban district authority in lieu of the existing rural authority. The public transport arrangements in the district are worth recording. I can recall that the first bus service was operated by a company called the Thundersley and Hadleigh District Motors, and it ran services daily from Hadleigh Church to Leigh-on-Sea. Once or twice a week a service also ran, once or twice daily, to the Woodman’s Arms at Thundersley via Daws Heath Road. An interesting thing that I recall, as a young boy in 1920, is that one of these buses, which were single-decker only, had a large bag on the roof to contain gas to propel the vehicle because of the limited availability of petrol. The first general bus service to run through the new urban district was operated by a company called Westcliff-on-Sea Motor Services. Some of the early vehicles, which were double-decker, had solid tyres front and back, and the driver’s cab was completely open to all the elements. The driver’s only protection, if it was raining or very cold, was a sheet, which he could draw up and fasten more or less under his chin. Westcliff Motor Services ran a service from Southend through Hadleigh to Thundersley, down Kenneth Road, back along Hart Road to the Woodman’s Arms and then on to Rayleigh. I can remember also another bus service that came into being was operated by Edwards Hall Motors Limited. That company operated Vulcan vehicles and they were all saloons, which had pneumatic tyres on the front wheels but solid tyres on the rear. If the camber of the road was fairly steep, then in wet weather the rear of the bus had a tendency to slide sideways and bang into the kerb, which was somewhat uncomfortable for the passengers and quite alarming for those new to the service. I will conclude by stating a few personal facts. I was appointed Clerk of the Rayleigh Urban District Council in 1939, and I served there for another 35 years in that capacity until I retired in 1974 on local government reorganisation. I had the honour to occupy a number of special posts during the war years such as Food Executive Officer, Local Fuel Overseer, National Registration Officer and Local Invasion Officer. During my period of office, my wife and I had the privilege of attending three Buckingham Palace garden parties and, finally, in 1975 I had the honour of being included in the Queen’s birthday honours for that year. Shortly afterwards I attended at Buckingham Palace with my wife, my daughter and one of my sons, and received an honour from Her Majesty, namely, the Member of the Most Excellent Order of the British Empire (MBE). The Queen herself, after pinning the award on my suit jacket, spoke to me for two or three minutes. She was most charming and looked wonderful, I remember, in a striking yellow dress. My award was for services to local government in the county of Essex. It was certainly a memorable way to end my local government career. I am often asked what I would have chosen as a career if I had my time again. My answer has never wavered. I would not have changed a thing. I was extremely fortunate to enjoy every single day of my working life. And of one thing I am quite certain. Without the unswerving support of my dear wife, Ida, I could not have achieved so much. For that reason I have dedicated this work to her memory. Copyright in this work is owned by the Executors of C E FitzGerald. Neither the whole work nor any part may be reproduced without the prior written consent of the copyright owners. My Grandfather Alfred Harding was a building Inspector (mainly Drainage) for Benfleet Urban District Council in the 1930’s and during the 1940’s and rented Moxley House during the war period, as the bungalow in Homefield Avenue was too small for the girls who were at courting age. I have a post card from my Father Alfred Walter Harding who was in Chatham Barracks (Royal Engineers) September of 1938, to his family at Moxley House. Does anyone know what year that Fowles Avenue changed its name to Queensmere & why? My grandmother lived at number 1 until her death in 1970 & I spent the first year of my life in her home (1952/3) when it was still named Fowles Avenue!